After a disappointing Dragon Age II, many players got disheartened with the series, and were not anticipating the next entry in the saga. The time is now – to judge the Witcher’s greatest rival, and see if BioWare can still craft memorable RPG games. The year 2014 will certainly be remembered as one of the best in RPG history. It was this year that we have laid our hands on the likes of: Dark Souls 2, South Park: The Stick of Truth, Divinity: Original Sin, Diablo 3: Reaper of Souls, and the recent Legends of Grimrock II. Up until now we weren’t treated with so many games of the RPG genre a year, that were also of such a high standard. The great RPG year ends on a high note with the newest big game from BioWare – Dragon Age: Inquisition. After Dragon Age II that left much to be desired, the Canadians prove that they still know how to craft a RPG masterpiece worthy of their legacy. In Dragon Age: Inquisition we once again visit the conflict-stricken land of Thedas, which is in dire need of a hero. The plot itself isn’t the most original in recent memory, being a standard story of a hero saving the world from great peril, it is the delivery and quality of presentation that make it interesting. In contrast to other modern fantasy RPG’s, we won’t do miracles on our won or with a handful of companions. As the founder of the titular Inquisition, we will have to strengthen the power of our organization, gain strong allies and influences, before heading for the final battle. We will achieve all of that by performing various tasks, commanding our army, diplomacy, and also keeping our supplies in mind. The creators have flawlessly succeeded in making the player feel like being a part of something bigger than themselves. Only with the help of the Inquisition will we be able to influence the fate of the world. It is way more believable, than being a champion who single-handedly takes up a heroic crusade. In the game we will come by some old friends, like, amongst others, the talkative dwarf Varrick, with his faithful crossbow Bianca. The positive reception of the plot, certainly owes much to the dialogues. All of the dialogues are dubbed, and well-written. There are however low points in the writing, but they are easily forgotten when taking into account the massive scope of the present material. 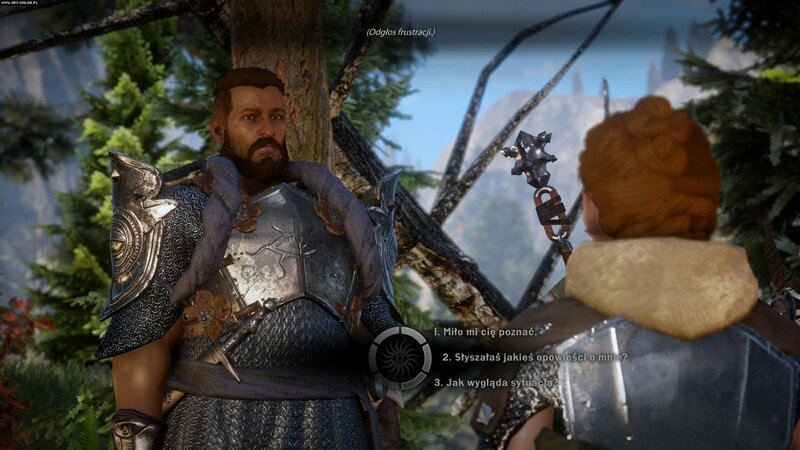 The game also sees the return of the dialogue circle introduced in Mass Effect, that has been significantly changed since Dragon Age II. The artificially divided good, bad and the ‘cynical/ funny’ options have also been removed. Instead of that, our responses are appointed icons, that determine emotions, that accompany certain lines. Thanks to that, it is easier to make that right choice, and not have our character utter the complete opposite of what we intended to say. A certain surprise comes when we realize that we were rid of an option to play the anti-hero. This time around, one way or another, we always strive for the ‘good’ outcome, but it depends on our judgment, as to what we perceive as just and honorable. We can be a kind leader, who acquits their prisoners, or a ruthless badass who simply condemns the wretched souls. That is certainly a step in the right direction, as the lines of the evil protagonist in the previous entries have often seemed forced and were not believable enough. They were rather making us come off as a troubled scoundrel, rather than allowing us to express ourselves as an intriguing baddie. The Asylum is the Inquisition’s first headquarters, in which we will plan our organization’s operations. 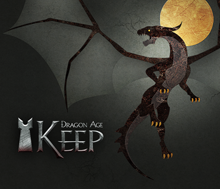 Dragon Age: Keep is a special webstie through which we can recreate the most pivotal events of the first two games in the series. 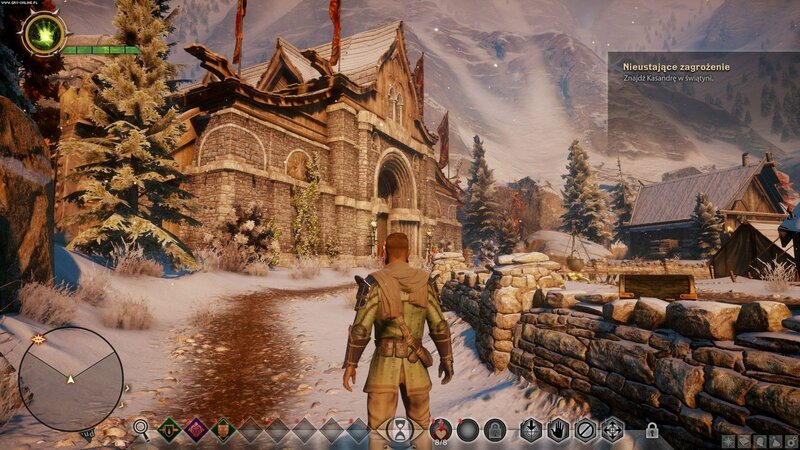 One of the site’s most crucial elements, is an ability to change the decisions made by our former protagonists and implement them into the world of Dragon Age: Inquisition. For the application to influence our playthrough however, we must take advantage of it during the character creation process! The option works both on the PC and the consoles. To the gamer’s delight, most of the information regarding the game world can be obtained through dialogue. A certain Tevinter mage will be more than happy to educate us on the customs and the political system of his land, while a certain dwarf merchant will fill us in on what is going on in the dwarven city of Orzammar. Those who fancy reading, will also be pleased. 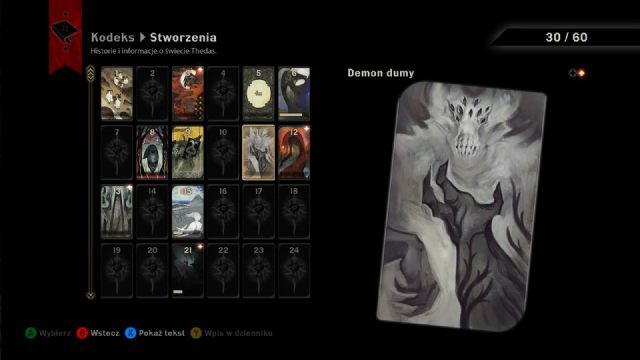 The codex known from the previous games has been greatly expanded, and its’ unlockable entries are quite numerous. The equipment interface was designed concerning the consoles and sadly, can irritate at times. 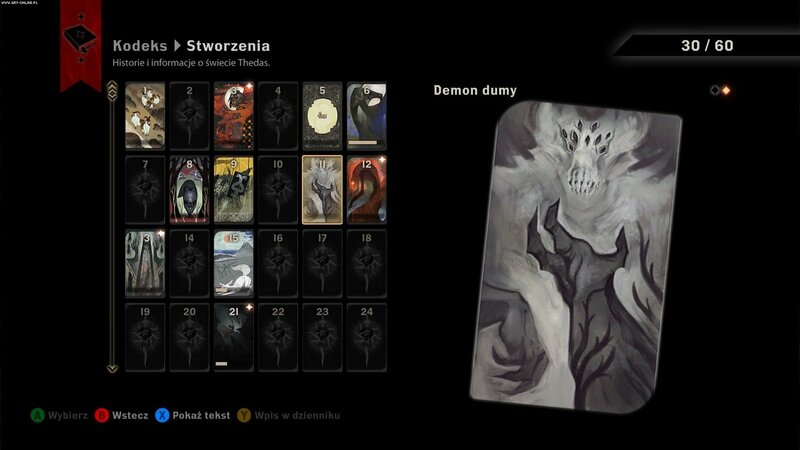 Despite the fact that prior knowledge of the previous games is not mandatory to follow the plot, Dragon Age fans will be overjoyed with the amount of references to past events and characters. The gamers will get to reunite with a wide range of known and beloved characters. The members of the Inquisition include the likes of dwarf Varrick, the bard Leliana, and even the fabled champion of Kirkwall will show his or hers support to our cause. We will also get to hear a lot about the actions of the Grey Warden from Origins, who stopped the Blight. The list of the recurring heroes is quite lengthy, and hearing about the fabled events, in which we partook in the past, is taking the term ‘fan service’ to an entirely new level. 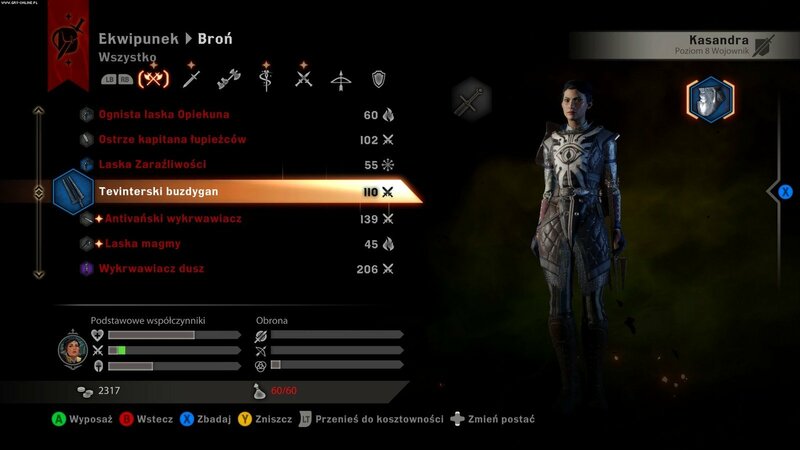 Inquisition might not be allowing us to import previous saves, but all of the decisions made in the past can be recreated and used in character creation using a specially prepared website called Dragon Age: Keep. It is an extraordinary feature that should from now on become a standard in such games. A crucial part of the story involves mysterious rifts leading to the Fade, which can only be sealed by our protagonist. The greatest revolution in Dragon Age: Inquisition, is the game world itself. It might be still divided into separate locations, but their size has changed greatly. In the game we will find some quite enormous areas, that simply overflow with content. 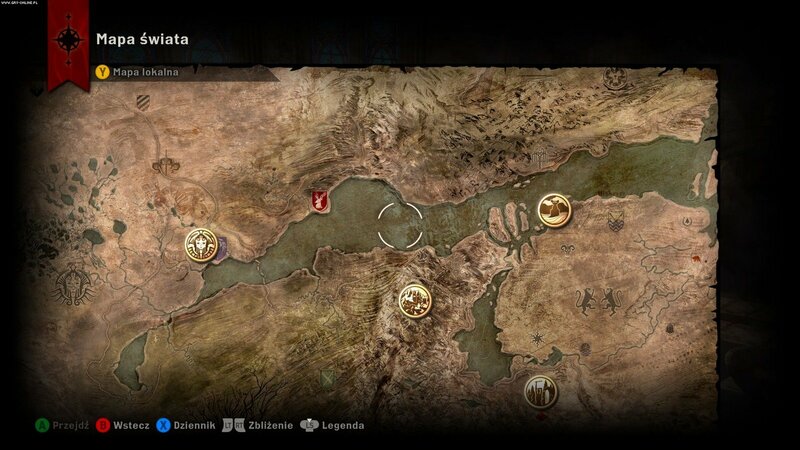 The locations are filled with numerous side quests, ruined temples or interesting collectibles. When first setting foot in one of those vast locations, one might get a feeling that they are playing another game in the GTA or Assassin’s Creed franchises, rather than a RPG. At first the player might be overwhelmed with the sheer scope of the possibilities, but when the dust settles, the effort put into bringing Thedas to life, is greatly appreciated. Completionists and ‘maxing out’ enthusiasts will have to brace themselves for over a 100 hours long playthrough, and when the intention to go over all of the dialogues and read all of the notes found in the game arises, that number can easily increase to a whooping 150 hours. Apart from a few vast areas in the lands of Ferelden and Oralis, the game also offers several minor locations, connected to various quests. When it comes to size they resemble the locations in previous games. Despite some of them representing a high standard in design, several areas are an exception, like the capital of Orlais that, apart from being small, comes off as sterile and bleak by comparison. Luckily, such places are rare, and not common. 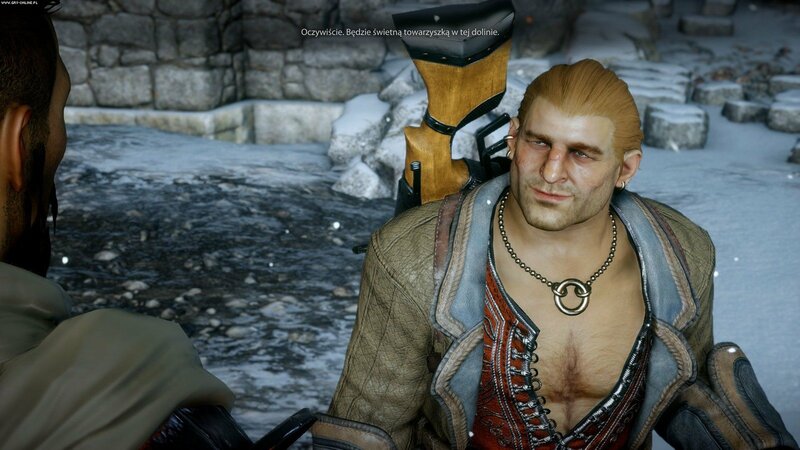 As expected from Dragon Age, an appearance of blood stains after a successful battle could not have been left out. The game’s fortress, functioning as our base of operations and headquarters, plays a crucial part, and deserves a separate paragraph of this review. A lesser version of our hideout is offered at the start, but after a dozen of hours we get to move into a real masterpiece, the castle of Skyhold. For years now, BioWare has been giving the players a chance to inhabit their own virtual residence. The tradition having its’ origins in the Baldur’s Gate series. Skyhold is the crowning achievement of the years-long attempts and probably the best example of such an element in the RPG games history. It is here where we will spend most of our time talking to our companions, greeting guests, deciding on the fates of our prisoners, crafting new items, planting herbs or just enjoying the magnificent sights. Nothing stands in the way of adjusting the fortress to match our tastes, and the possibilities are quite numerous. From modifying tapestry, through changing the look of the throne, to changing the window types. While not being a fan of interior design, I must admit, that I grew close to Skyhold to such an extent, that I took much pride and had put much detail into redecorating my fortress. The game also features an extensive codex, decorated with stylish illustrations. 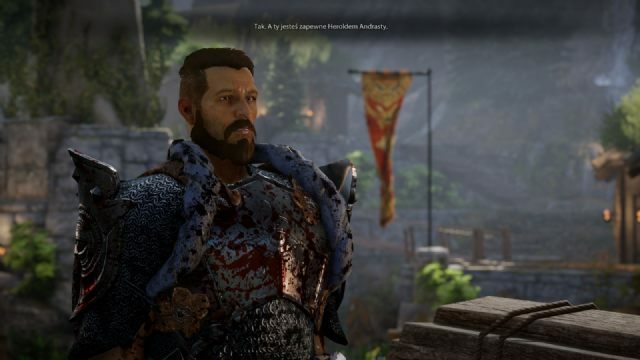 Certainly, the worst element of the new Dragon Age, is the combat system that resembles more that from our action-packed visit to Kirkwall, rather than that of tactical encounters from Origins. Giving credit where credit is due, the game features many skills, character development is intriguing, and during combat we can rely on flanking and stunning. Sadly though, in most cases, encounters come down to spamming all of our available skills. Due to splendidly engineered animations and sounds, it is quite fun, but in the end, stands out amongst other, much greater, elements of the game. Boss encounters are an exception, as during those, it is worthwhile to rely on the active pause and the tactical mode, as even a slightest mistake, can end up being dramatic for our party. However, playing in the tactical mode most of the time is not recommended – manually handling all of the characters proves tiresome. I ended up frustrated at the tactical mode thanks to the poorly executed camera after relying on it in the first hours of the game. Finally, the dragons are also worth mentioning, as they are quite the opponents and can really get on our nerves when our party isn’t well developed. Luckily for the players, the majestic lizards differ much from their cousins in Skyrim, they aren’t randomly generated, and their number is finite as they appear in predetermined places. Due to that, slaying each one of them gives a ton of satisfaction and loot worthy of such a beast. Graphics are phenomenal. The creators made a good use of the Frostbite 3 engine, and left us with quite a visual feast. The spell effects and landscapes look especially good while Inquisition’s waterfalls and forests leave to competition far behind. In spite of being minor elements, they still manage to bring joy, even after a few dozen of hours. The only drawback being the complete lack of environmental destruction. The player can’t even smash a barrel that is just begging to be treated to an axe swing. It is even more shocking, keeping in mind that the game was built on the same engine that Battlefield 4 was, in which we were able to destroy almost everything. A visit to Thedas, after playing Diablo 3 or Dark Souls, might prove traumatic for destruction aficionados. Dialogue circle is back but You won’t find classic – good, bad, funny answers. 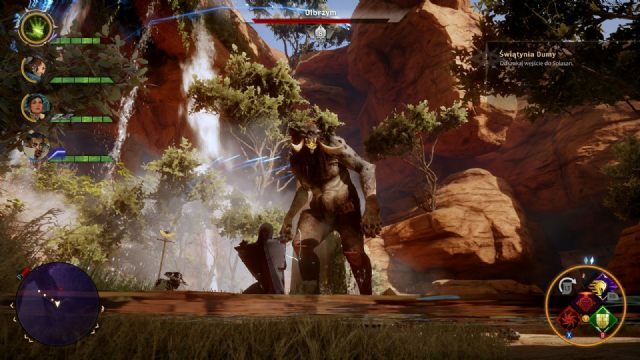 Although, Dragon Age: Inquisition aims mostly for a singleplayer experience, the players were given a competitive online mode. However, it has nothing to do with the plot of the main game. We get to play an entirely different character, and our task is to complete one of the three special maps with three of our friends. Taking down another waves of enemies, we are awarded items and unlock, previously locked, character classes. The fun is there, but it is hard to imagine repeating the same locations for dozens of hours on end. Despite the fact that they house some random elements, and the creators promise to add new maps, that mode does not seem to have a bright future ahead of itself. What is more surprising, is the addition of microtransactions, which allow us to buy chests with random loot. All of those chests can be also bought by the in-game currency, and the multiplayer does not make the better loot influence the game’s balance. Following the story, we will get to tour Orlais, but also venture to the well-known land of Ferelden. Dragon Age: Inquisition is not only the best and the biggest entry in the series, but it is also one of BioWare’s best games up to date. It can proudly stand next to the other masterpieces of the genre, such as Baldur’s Gate II, Mass Effect II or Star Wars: Knights of the Old Republic. Interesting story, a compelling cast, the phenomenal fortress Skyhold, a vast world… The list goes on, and on. The game isn’t flawless – there are minor mishaps, the combat system is far from being perfect and some parts of the plot could use better writing. All of that however, can be easily forgiven, taking into account the enormous scale and top notch quality of the majority of the game. Not mentioning other elements, such as the neatly created 2D graphics, brilliant bard songs or the excessive crafting system – but summing up all of the qualities of this title would take up not few, but a dozen pages of the review. It is best to experience them first hand – as even after many hours spent with the game, one can still bump into something interesting and new along the way. 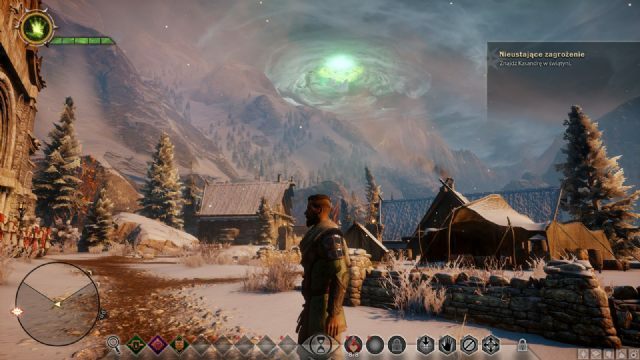 Dragon Age: Inquisition is truly a game that puts the series back on to the RPG fan’s map.